The job of research is to distill complex problems so that your team understand the what, the why, and the how of the problem at hand. Yet when presenting complex-yet-eye-opening data to colleagues, a tidy 10-page report can fail to elicit the right reaction. That’s because when it comes to sharing research with your colleagues, presentation matters. The right presentation can transform something that sits on your colleague’s desk collecting dust into insights your team can really engage with. And one of the best ways to present strategic, complex, controversial, or high-volume data is to use storytelling. Stories are a people-friendly way of sharing and understanding complex data. If you’re working with a team that has diverse skillsets and varying technical knowledge, storytelling is a powerful tool. By presenting your project as a story, you not only make your data easily comprehensible, but you immediately establish common ground for your team to work together on. That means more participation and collaboration from the entire product team. If you want your team to actually remember your insights, stories will help. In fact, it’s scientifically proven that stories are easier to remember than facts, meaning your presentation will have a lasting impact on the team. So how can you use data to tell the most impactful story? Firstly, you first need to understand what your key takeaway is. When the presentation is over, what insights should the audience be left with? This will be the anchor to your story. Once you’ve found your anchor, you can use the rest of your insights to thread together the presentation in a way that supports it. Looking through your insights can be intimidating. Often there will be many insights that can serve as anchors, and several ways to weave your story together. When you’re starting to craft a story, using a process to develop it is key. Most people are eager to jump into creating a presentation so they can share their insights, dumping data into Keynote before knowing the story they’re going to tell. This can actually slow you down and complicate your storyline. 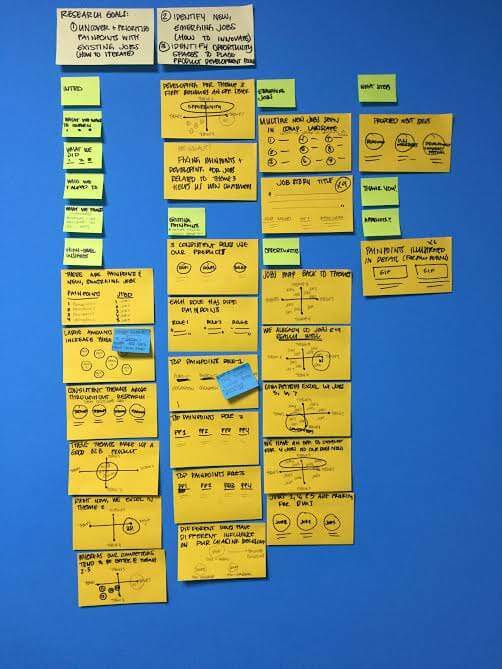 A great trick to quickly nail down your storyline before you sweat the details of a digital presentation is to create your high-level presentation with Post-Its. Each Post-It serves as a slide. You don’t have to have the final content decided at this point, but each Post-It should capture the main point of each slide. 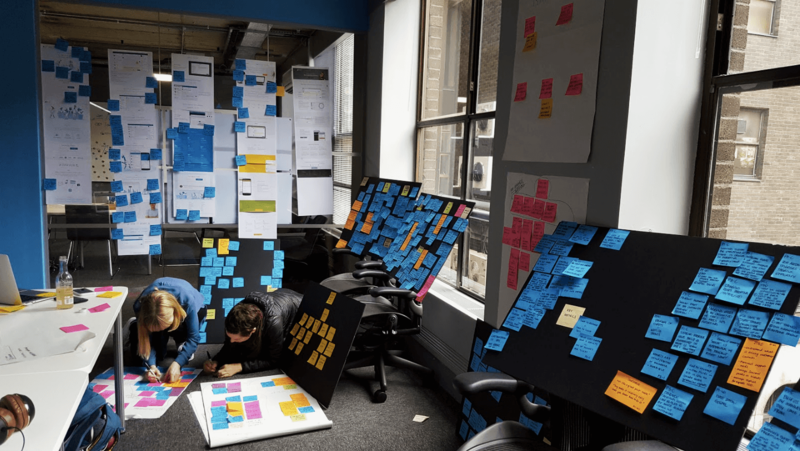 As you start to flesh out your story, move the Post-Its around to make sure the story you’re telling makes the right point in a concise and coherent way. When you’re happy, read through the headlines of each Post-It. If you’re not getting hung up on the order the information is presented, your high-level presentation is done. Once the story makes sense, scan through and highlight anything particularly complex, anything that uses multiple pieces of data, and any place where your audience might get lost. Storyboarding your presentations first is a great way of making sure you’re making the right point before we go on to sweat the details of a digital presentation. Visualizing insights, while intimidating to a lot of folks that deal with data, is the best part of the process once you get a handle on it. Firstly, decide what type of visual will be most impactful for you to use. An evolution warrants a timeline, a comparison can use a Venn diagram, whereas showing an opportunity space would need a two-by-two matrix. A timeline can easily show how something changes as time goes on. A Venn diagram can show a comparison between multiple objects. A two-by-two matrix can clearly show where the opportunity space is. Once you’ve picked out your visual, it’s time to put pen to paper and start sketching (yes, real pen and real paper). As you’re sketching there are a few things to keep in mind. Make your life easy by using simple shapes first. Start with squares and circles, and move onto more complex shapes if your visual doesn’t get the point across. Use color intentionally. Never make your audience think about why you’re using a specific colour. When you start sketching, start with one color. If the drawing doesn’t make sense, add more color to see if that helps. It often takes me 2-3 quick sketches before I decide on the visual I want to use, but sketching them before I create them digitally saves me hours of time. As you’re doing this, you will notice that even simple visuals have multiple pieces of information your team will need to understand. Even with a visual that makes sense, this can be a lot for someone to take in when it’s the first time they’re seeing the information. So once you’ve created a visual that matches your storyline, deconstruct it. Breaking your visual into multiple pieces will leave you with a visual that’s crystal clear for your team to understand. Deconstructing your visual into individual elements can help you identify additional pieces of information your team will need to understand the larger insight. With a solid diagram sketched out in story form, you can move on to making your digital presentation. Start by creating your final visual first, making sure you leave room at the top of the slide to add a title. When you’re happy with it, duplicate the slide and start to deconstruct the visual. This will ensure your visual is consistent in size, colour and positioning from slide to slide. When your visual story is in place, it’s time to add a title to each slide. Rather than simply describing the visual itself, add active titles. Active titles add all-important context as you move from slide to slide, helping your audience understand what they should be thinking along with the visual. The title should concisely capture the key point you’re trying to make. When I’m done with a section of a presentation, I skim through reading only the titles – if the story doesn’t flow, or I can’t understand the point of one slide, that means I need to keep reworking the titles. With titles and diagrams finalised, the last step is to flesh out the presentation as you normally would. Active titles can support your story and bring visuals to life. It also means that anyone at your company can reference them at a later date. While it’s less time-consuming to compile a report, telling a story transforms work from being interesting to observe to being impactful and actionable for the whole company. A story is something everyone can have lasting impact long after the presentation is over. If you’re a researcher, data scientist, or even a marketer, telling a story with the insights you’ve uncovered can give your work the power to impact the entire company at any point in time.